Kai Brach is the publisher, editor, and founder of Offscreen Magazine, a print-only publication that explores the human side of technology and the Web. Kai makes the most of being his own boss. He chatted with us about what it’s like being a German living in Australia, the lasting impact of his backpacker year, and the continuing importance of travel in his life. How does your personal history influence your work? I’m originally from Germany, but I’ve lived in Australia for around 13 years now. Although I had a wonderful upbringing, my parents are glass-half-empty kind of people. It’s a generalization, but I really believe Germans always look for things they can improve rather than enjoy the positives that already exist. I never realized this until I moved permanently to Australia, where people generally take life more lightheartedly. This became even more obvious when I met my girlfriend, an Aussie, who is a real optimist and the only person I know who manages to practice positive reinforcement every day. I think these two contrasting attitudes continue to shape the way I think about my work and myself. On one hand, I’m a hopeless perfectionist, and I always worry about the next issue not being up to my standards. But on the other hand, I’ve come to embrace a more wabi-sabi approach, and I understand that the occasional typo or misalignment are simple by-products of a magazine that’s made by just one person. The first, truly impactful trip overseas was my backpacking year in Australia in 2002. When I arrived from Germany, I barely spoke a word of English. I bought a van and traveled once around the country, doing all sorts of odd jobs to survive—from tomato picking and working in bars to cleaning pubs and scrubbing trays in a bakery. I was completely free of any obligation other than figuring out where to go next. In retrospect, I think that’s when I learned the most about myself and my abilities. I was incredibly lonely sometimes, but not always in a bad way. There was so much time to think and just enjoy the experience. Traveling alone for such a long time also gave me the confidence to manage difficult situations and solve problems when they occurred—like how to not lose all hope when you find yourself in the middle of a desert with a blown-up tire and no spares. Has that travel experience influenced your work? The experience shaped me in two ways: First, I realized that I could manage very well on my own. Although I sometimes miss working in a larger team, I function best when I can work independently and at my own pace. Secondly, after enjoying the flexibility of working when and how I wanted, it seemed impossible to go back to a typical nine-to-five job. I returned from Australia and never took up another full-time position at a company—I’ve been freelancing or running my own shop ever since. I often think back about that trip as a backpacker. I feel extremely lucky and privileged that I was able to spend a year exploring this amazing country. But it also makes me a bit sad to realize that I will never feel as commitment-free and curious about life as I did then. What’s a favorite memory from a more recent trip? A couple of years ago, my partner, her family, and I were traveling in a small van in Sri Lanka when we started to interact with a local family traveling on the back of a pickup truck in front of us. (I’m white and my partner’s family is of Chinese descent, so we stick out like sore thumbs there.) We were waving and smiling at each other when suddenly the cops pulled both of our cars over. I think we had to pay a $2 fine. But more importantly, we got to talk, well, hand signal with the other family. We had a few toddlers on board and so did they. Everyone was like, “OMG—how cute!,” so we did a quick baby swap while the cops filled out the paperwork. Turns out a recently married couple was traveling in the pickup truck. My partner’s mum took off her earrings and gave them to the new bride. She was over the moon! Smiles, excitement, hugs, tears. It was the most amazing, memorable fine I’ve ever received and it just made all of us feel great for the rest of the week. Traveling alone for a long time gave me the confidence to manage difficult situations and solve problems when they occurred. What do you value most in a city you are visiting? Easy public transportation, particularly to and from the airport, is the first thing that makes me feel good about a city. There is nothing more frustrating than feeling lost at the airport after a long flight. You can tell a lot about a city’s sensibility for design and its overall hospitality by how easy they make it for foreigners to buy a train ticket or figure out how to get from A to B. I think some European cities, like Amsterdam and Copenhagen, are doing a great job at guiding their visitors. How would your life be different if you didn’t live in Melbourne? Sometimes I wonder how living in a small country town would affect me. I grew up in the country, and when I go back there now, I perceive time differently. Things feel slower, more intentional. Everyone is more present and people are more willing to converse and listen. When I come back from visiting my friends and family in my hometown, I always feel somewhat rejuvenated—and a bit bored. Ha! If you could relocate tomorrow, where would you go? In 2012, my girlfriend and I spent a year in Berlin’s Friedrichshain district. I’d probably try to buy a small apartment somewhere near there and then use the money I’d save compared to living in Melbourne to travel for at least three to four months every year. Berlin has always been my second choice as a place to call home. The history, the architecture, the overall impact of socialism—there are so many aspects that make it a unique place. 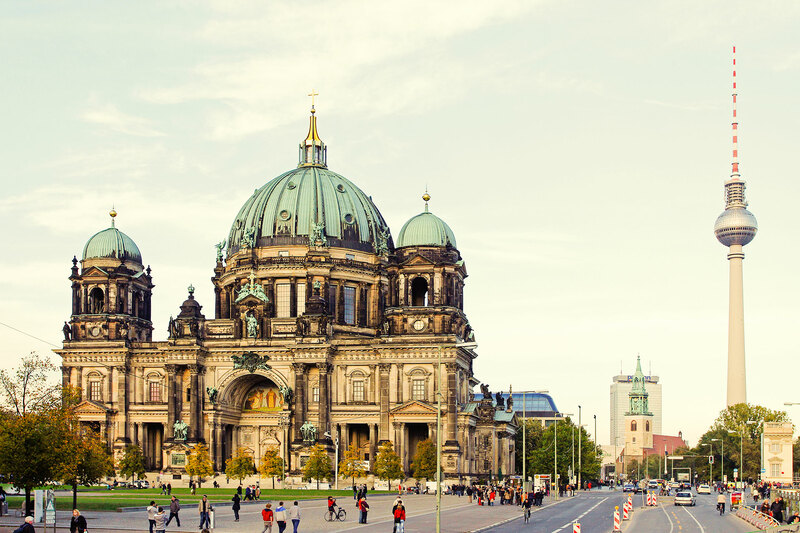 What’s amazing is that Berlin, while getting more expensive, is still an incredibly affordable place compared to other major European capitals. Where rent is cheap, artists and creative types flourish. When you don’t have to work three different jobs to pay the bills, you can focus a lot more on your own work and as a result, enjoy life. That gives Berlin a totally different pace than any other city I’ve been to. No doubt, it’d affect me in positive ways, too. What is a recent story you’ve worked on that relates to space, place, or community? In issue 13, Francesco Kirchhoff writes about his experience designing apps that track Ebola outbreaks in Liberia and how his visit to that country fundamentally changed his idea of good design. He talks about field-driven design, an approach that highlights the disparity between the software we create in our comfortable offices in the Western world and the real-life application of that software in remote towns with no network coverage or electricity. 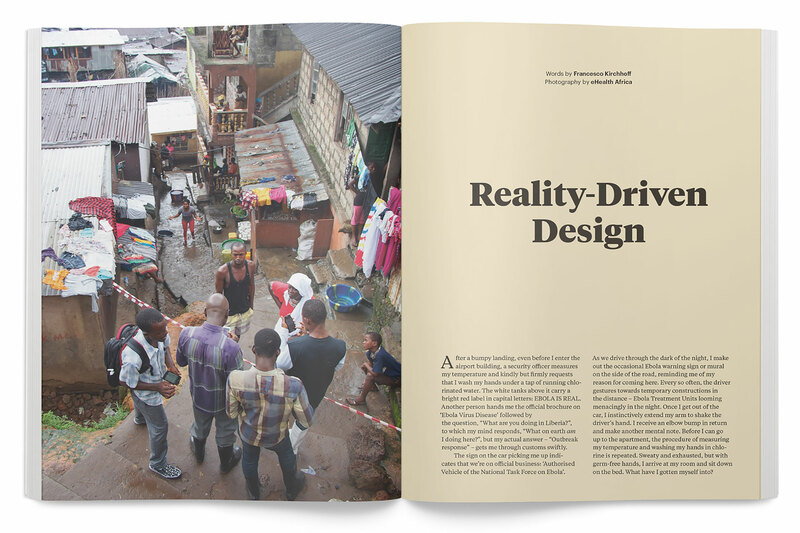 Offscreen Magazine issue 13: “Reality Driven Design” by Francesco Kirchhoff. What is your favorite magazine store? That would have to be Do You Read Me?! in Berlin. I visit every time I’m in that city and every time I find a stack of magazines I’ve never heard of before. They really get the curation part right. The shop’s layout and ambience also encourages browsing. I have to exercise a lot of self-discipline not to splurge when I’m there. The second in line is the fairly new magCulture Shop in London, which was started by the founder of magCulture Journal, Jeremy Leslie. I haven’t been to it myself, but I’m a big fan of anything Leslie is involved in. Do you have any Melbourne neighborhood gems you’d like to share with us? 1. Laksa King: I love a good Laksa, especially in winter. This restaurant is a bit further out of the city center but worth the trip every time. 2. Gelato Messina: The best ice cream and the best selection, ever. Even a trip to Italy couldn’t beat it. 3. Industry Beans: One of the many, many great cafes in Melbourne. There are about 30 others in walking distance. 4. Izakaya Chuji: I love this tiny sake bar. I’ve had lots of great nights and wonderful conversations there. 5. Shimbashi Soba: This place makes its own buckwheat soba noodles—perfect for summer and winter alike. He realizes and takes comfort in the fact that, beneath the surface, we’re all just barely holding it together. Cover image by Emma Murray. 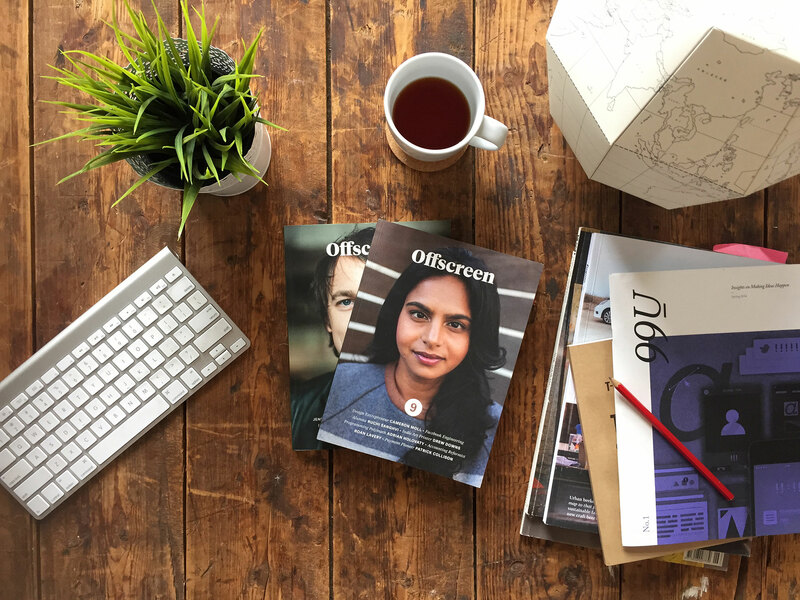 Learn more about Offscreen Magazine here.